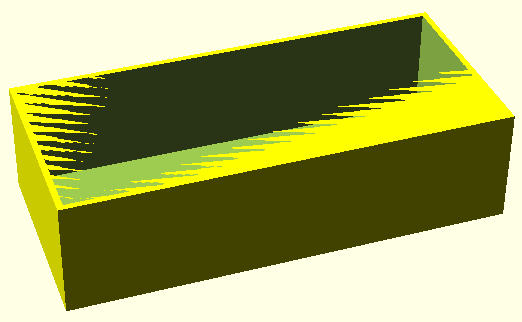 I've tried OpenSCAD for mac (v2015.03) with a sample form. My goal is to create an empty box (with a cover not yet designed). The same code doesn't give the same preview. I did try the developer version (v2018), I still have the same issue. I think the code is ok, but just in case, I'll give it attached. Here it is the code. please make the box you are using for the difference a bit bigger then the volume you want to remove, so that it is not ambivalent whether the surface has to be removed or not. Oh, thank you. I didn't know that wiki. I'm gonna read it right away.